And what that means to me, right now, in this instant, is that DANG I’m behind on my baby book-ing. Like, WAY behind. See, if I haven’t said it before (and I have) I’m always working on something in the way of journalling, and lately (and likely for the next 15 years) I’ll be working on this baby book (below) and many others. The one below is something special I wanted for Griffin that started off with grand intentions. I wrote a letter a month and pasted it in this altered book. 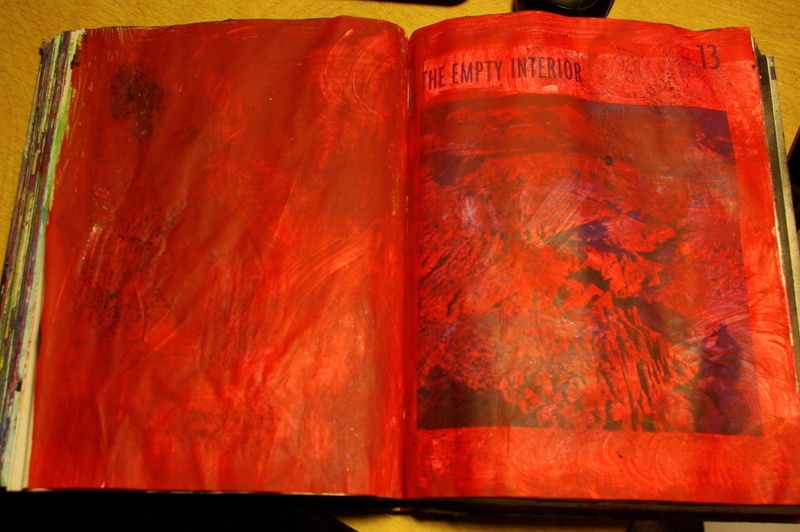 I painted, stamped, drew, etc on the pages and it was always accompanied with photos of what happened that month. For the first . . . 12, I was pretty good at keeping up. Then, not so much. There’s at least a letter for every 3-5 months, until now. My last letter was written in JANUARY of this year. That’s nine months behind folks. NINE long months behind! So, tonight since the babe was working on his own painting, stickering, etc I got out the old journal and let him help me with decorating the under pages. A few hours later and we have three new spreads (two with photos and captions and one celebrating his birthday (which was in July!) accompanied by a letter to sum up the last nine months). We’ve had a rough go of things the last nine months though, if I’m being honest. I’ve touched upon it here and there, but mostly it’s just best to keep things personal to ourselves, at least a little bit. So, I worked a teensy bit in the altered journal of my own as well, and hope that this is the last spread that bares any resemblance to this. You can see a few past pictures of both my altered journal pages and Griffin’s letter journal here, or if you’d like to take a look at my altered book documenting my pregnancy/fertility journey, go here. I hope to keep up with this this fall, hoping beyond hope that things start to change and the fall brings that change. So, here’s to new beginnings, even in the fall. wow! i love these books..